DC Password And Encrypted Data Manager Doc - Administration - Douglas Computing, Inc. Please note: many of the steps outlined in this section of the tutorial, requires the user to have administrator privilege. 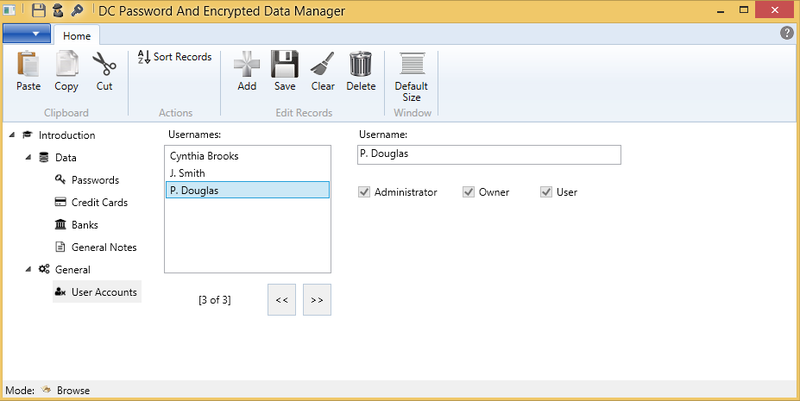 The DC Password And Encrypted Data Manager allows you to create user accounts, and assign different roles to users. The roles which may be assigned to users are: Owner, Administrator, and User. The person who initially logs into the DC Password And Encrypted Data Manager is considered the owner of the application, and is automatically assigned all possible roles. This gives the initial user / owner free access to all aspects of the application. Also, the owner's user account record can never be deleted from the application, or his roles changed. Only his name can be changed. Users who are added to the database via user account records, are automatically assigned the User role. This cannot be changed. However, users added after the initial user, may be assigned administrator privilege. Users who have administrator privilege, have access to User Account records as shown in the screenshot immediately below. They also have full access to the application menu as shown below. Users with only User role privilege, do not have access User Account records as reflected in the screenshot below. Also, they have only limited access to the application menu as reflected in the screenshot below. Users added after the initial user / owner of this application are considered secondary users. To add secondary users, create user account records for them, and specify whether you would like them to have administrator privilege. After this has been completed, have them log into the application. When they initially log into the application, they will be greeted by the following regular screen. Have the secondary user select his user name, and enter a suitable passphrase that is 12 or more characters long. 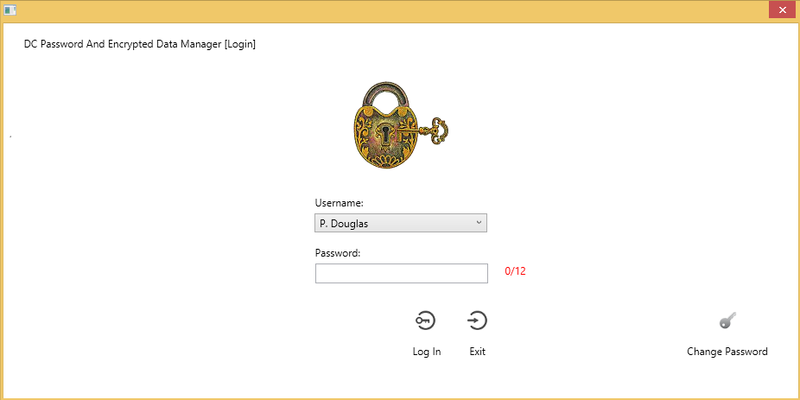 When the user does this and clicks on the Log In button, the following secondary initial login screen will appear. Have the user retype his passphrase in the second password text box, and click on the Log In button, to enter the application. After a user account has been created for a user, and he initially logged in, he will subsequently be greeted by the following screen, whenever he tries to enter the application. The user should select his user name in the username combo box, enter his password, and then click on the Log In button, to enter the application. 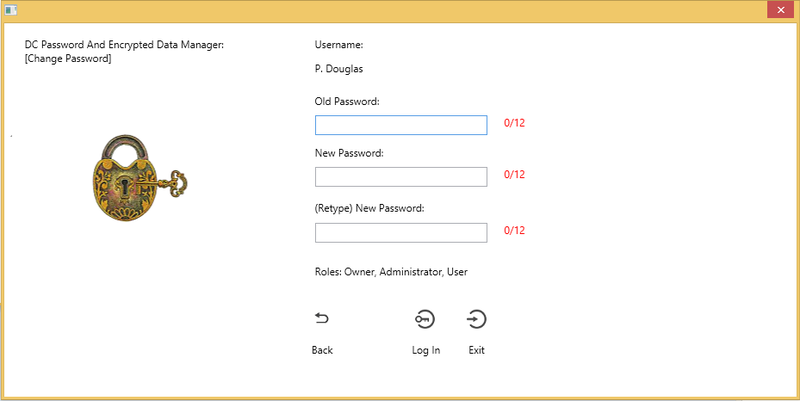 If a user or administrator believes the user's password may have been compromised, or the user would otherwise like his password changed, he may open the DC Password And Encrypted Data Manager, select his name in the username combo box, and then click on the Change Password icon at the bottom right of the resulting (regular login) screen. The above actions will result in the following Change Password screen appearing. The user should type in his current passphrase, enter a new passphrase, then retype it in the first, second, and third text boxes on the screen, respectively. 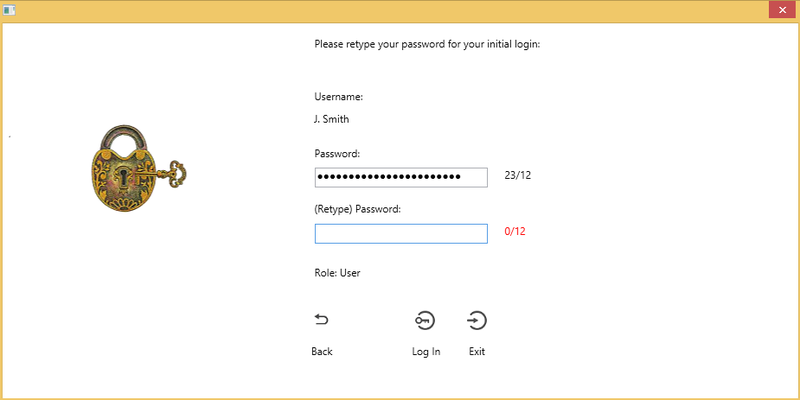 Afterwards, the user should click on the Log In button, to initiate the password change, and enter the application. 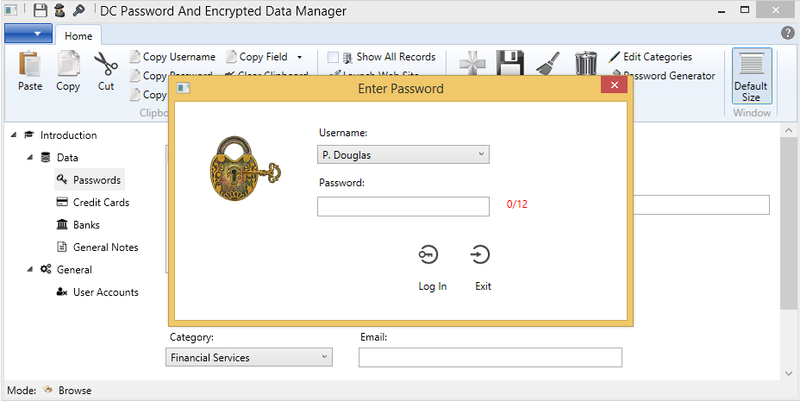 The DC Password And Encrypted Data Manager DOES NOT STORE USERS' PASSWORDS. Instead, the application encrypts a small piece of information, using the password the user provides, when he initially logs in. When the user subsequently attempts to login in, the DC Password And Encrypted Data Manager attempts to decrypt the small piece of encrypted information, with the password the user provides. If the decryption attempt is successful, the DC Password And Encrypted Data Manager authenticates the user. Otherwise, the user is not allowed to enter the application. 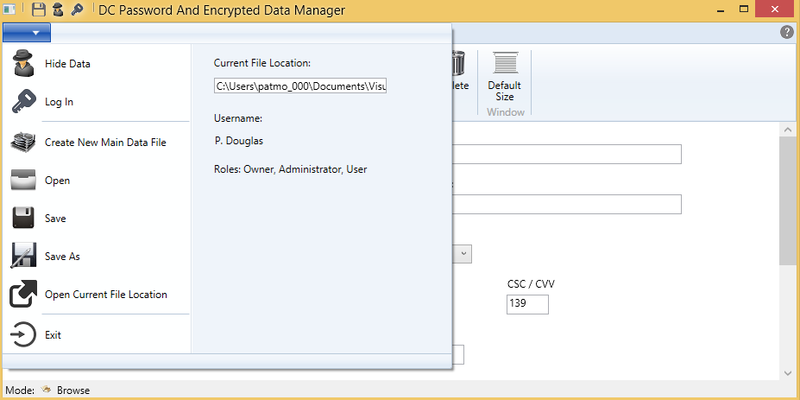 If you would like to create a new main data file (along with supporting files) for the DC Password And Encrypted Data Manager, from the main screen of the application, click on the down arrow in the blue section, at the top left of the application, to display the application menu, then click on the menu item, Create New Main Data File. Optionally navigate to the directory you would like your new main data file to be, then enter a name for the file, then click on the Save button. When you create a new main data file, all user account records in your previous main data file, will be imported into your new main data file. Also, associated text files supporting user accounts in your previous database, will be copied to the new main data file's associated directory. This will allow the users of your previous data files, to be able to easily access and use the new files. You may use the Save As application menu command - similar to the way you use the menu command in other Windows applications - to make a copy of your current main data file, along with associated files, and to begin using the new set of files immediately. You can then copy or move the old main data file, along with its associated directory containing supporting text files, for back up or other purposes. To use the Save As command, click on the down arrow in the blue section, at the top left of the application, to display the application menu, then click on the menu item, Save As. Optionally navigate to the directory you would like to save your new copy of the main data file, then enter a name for the main data file, then click on the Save button. 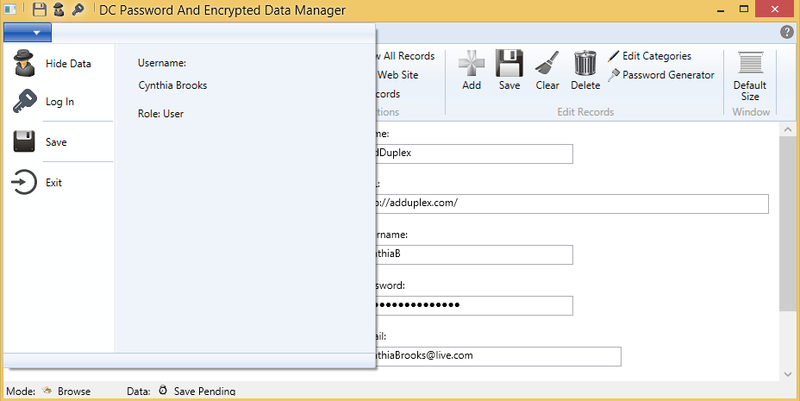 If you would like to open a previously created main data file for the DC Password And Encrypted Data Manager, click on the down arrow in the blue section, at the top left of the application, to display the application menu, then click on the menu item, Open. Navigate to the directory location of the main data file you would like to open, click on the main data file, then click on the Open button. Please note: for the above actions to work successfully, the directory associated with the main data file containing supporting text files, must be located in the same directory as the database file you open. Please also note: if the username and password you are currently using are identical to credentials existing in the database you are trying to open, and both credentials are associated with administrator privilege, you will be automatically connected with the new main data file and associated files. If the above is not true, you will be presented with a dialog box of usernames with administrator privilege. You will need to select a username and provide a valid password, to be able to open / connect with the main data file. To get quickly to the directory where the current main data file, and associated files are located, you may do the following. Click on the down arrow in the blue section, at the top left of the application, to display the application menu, then click on the menu item, Open Current File Location. 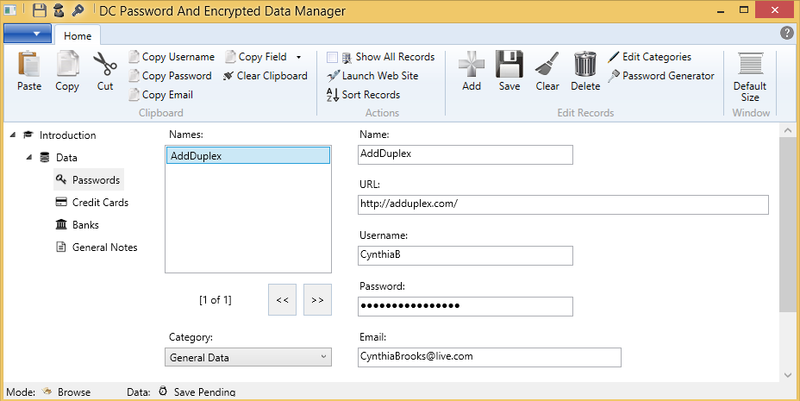 Backing up data for the DC Password And Encrypted Data Manager is straightforward. Simply copy the current main data file, along with its associated directory containing supporting text files. E.g. if the name of the current main data file is DCPasswordSaver.dps, and the name of its associated directory is DCPasswordSaver, simply go to the directory for the current database file (see the topic immediately above), and copy the file DCPasswordSaver.dps and the directory DCPasswordSaver to a directory location of your choosing.